We've been tracking an April trade in natural gas that has worked over 68% of the time over the past 24 years, as measured by United States Natural Gas Fund (UNG), with the average upside potential ranging from $0.60 to $0.85. With prices sitting down near recent lows and as we are still fairly early in the month, our researchers believe the opportunity still exists for some quick profits with an upside move from below $23.95 to a target level of $26 to $28 (roughly +9 to +18%). We believe the downside risk is rather limited with clear support visible below the recent lows (near $22.75) and a historical likelihood of any further downside price swing being below 33%. Our research team believes an opportunity to establish new longs in UNG below the current daily price gap (below $23.50) would be ideal. Historical data mining shows that average upside rallies at this time of the year are typically ranging just below $1. Thus, the upside potential for this move of about +9 to +12% should be sufficient incentive for quick profits. Skilled traders can hold a small portion of the trade for any potential run beyond these initial target levels, but we caution traders that $28.50 to $29.00 is an area of strong resistance. Our last trade in natural gas with subscribers in February 2019 netted us 30% profit in the VelocityShares 3x Long Natural Gas ETN (UGAZ) within 10 days. Our research team is still waiting for the Daily Upside Gap to fill with prices below $23.50 before we look to enter any new trades. We have been patiently waiting for the bottom in natural gas to form knowing that we have this trade set up with a relatively high success rate. 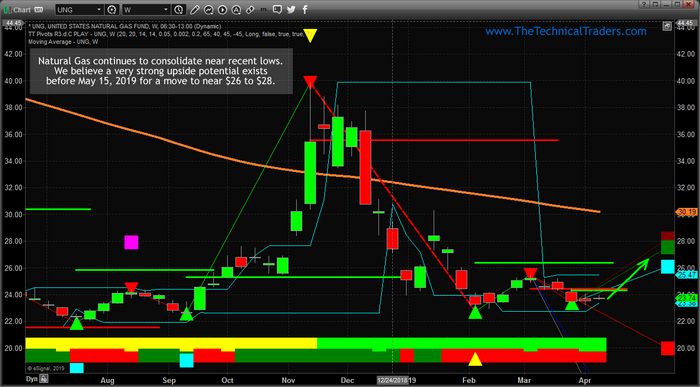 Keep an eye on natural gas, and look for any good entries below $23.50 in UNG – the deeper the better. Our Fibonacci modeling systems are already suggesting a bottom has set up and any upside price move above $24.30 will likely prompt a bigger rally towards $26 to $28.